Bread + eggs + [other ingredients] = the breakfast sandwich. It's a simple formula, but these places around town know how to make it unforgettable. The breakfast sandwich has a simple foundation: eggs between bread. From there, chefs have plenty of room to get creative. From spiced condiment to egg soufflés to scallion pancakes, here are some reasons to wake up and be happy that we live in an area with such a killer food scene. "The real star of the breakfast sandwich is the condiment," says Juliet co-owner Joshua Lewin, who opened the gratuity-included, profit-sharing, ahead-of-the-curve-when-it-comes-to-business-practices eatery in Union Square this past February. The cumin condiment on the breakfast sandwich (pictured above) was inspired by a few green dots on a tasting menu that he had at L’Astrance in France, a Michelin-starred restaurant. Lewin immediately knew that the green goodness was meant for a sandwich spread, he said. He was right. The taste is similar to pesto, but with a more complex flavor profile. The magic begins with whichever fresh greens Juliet happens to have on hand that day—kale, Swiss chard, carrot tops, radish tops, etc.—and is then driven by crushed cumin seeds and complemented with finely diced vegetables, preserved lemon, garlic, bell peppers, and chili peppers—all emulsified in olive oil for an easy spread. I discovered the buttery heaven that is The Plate’s biscuits last summer while working on a feature for Edible Boston on Milton’s Billion Backyard Bee Project. Since then, owner Suzanne Lombardi has added a larger location in the Milton Marketplace on Bassett Street, in addition to the smaller original on Central Avenue. 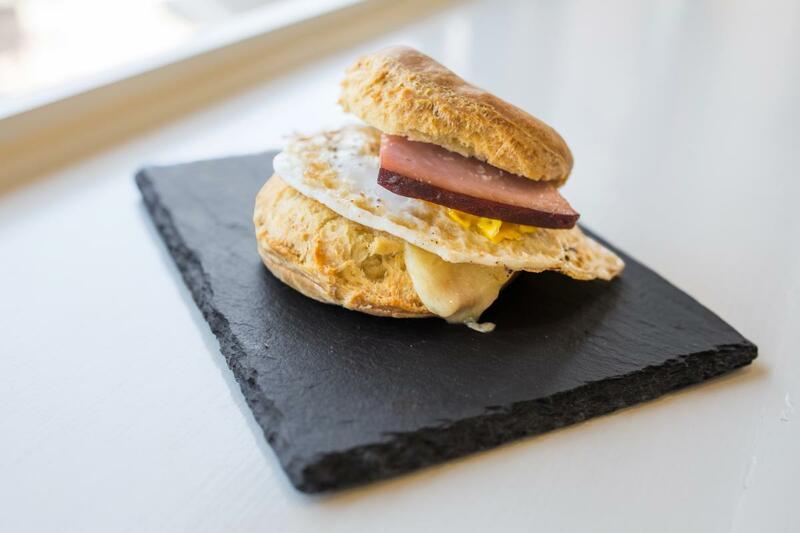 Sure enough, the biscuit translates beautifully to a breakfast sandwich when paired with an over-hard egg, melty cheddar, thick-cut artisanal cured ham and a very-sweet-and-slightly-savory red pepper jelly. Ana Sortun teamed up with pastry chef Maura Kilpatrick to create a small neighborhood bakery in Cambridge. As with Sortun’s other acclaimed restaurants, Oleana and Sarma, Sofra focuses mainly on eastern Mediterranean and Middle Eastern cuisine—specifically Turkey, but also Greece and Lebanon. 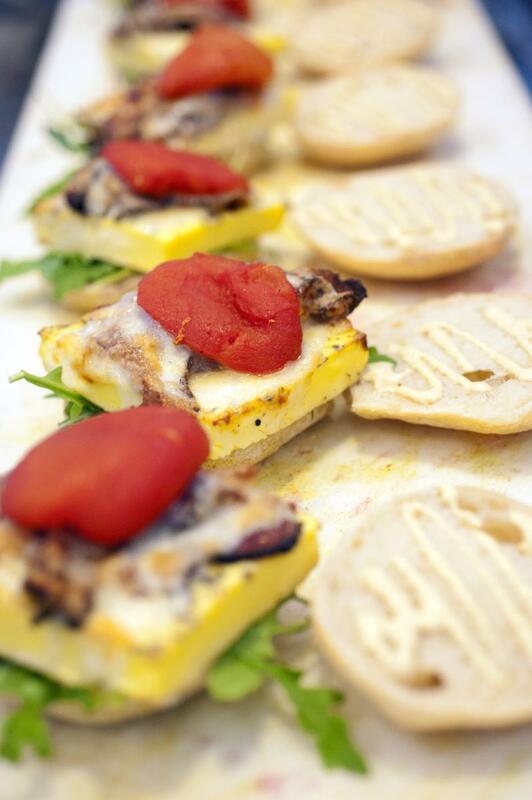 The breakfast sandwich’s eastern Mediterranean flair is found in the dairy: the thick slice of briny haloumi cheese is a perfect flavor fit with tangy feta butter. For proteins, they have a fried egg with a soft center, but you should definitely go for the optional bacon as well, because it’s bacon and you can never have enough bacon (duh). All this is packed between one of Sofra’s simple but delicious brioche buns. 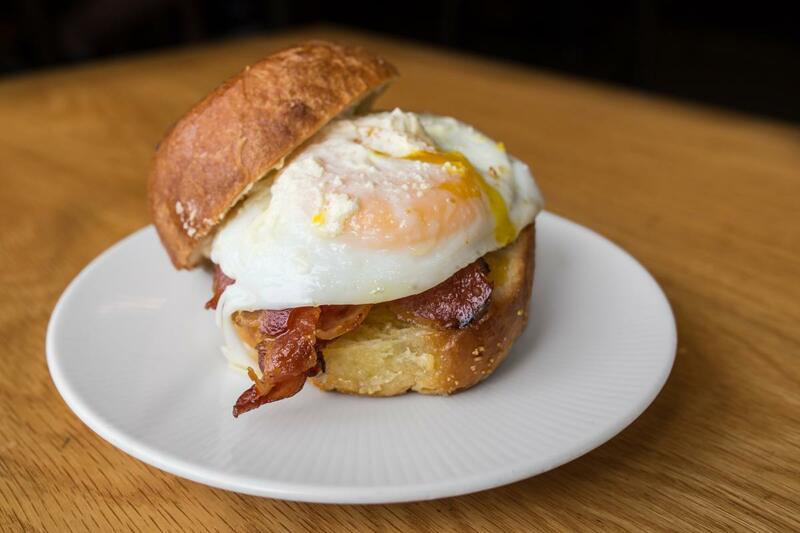 Okay, so I almost feel silly including Flour in this round-up because it’s so obvious to anyone plugged into the Boston food scene that Joanne Chang’s bakery mini-empire is going to have an amazing breakfast sandwich. There’s no foodie credit for finding this one. The breakfast egg sandwich stars an egg soufflé square, made by mixing eggs with cream, salt, pepper and thyme, then baking it all in an oven before carefully cutting the perfect shape. Add a dijonnaise—a creamy combination of mustard and mayonnaise—plus tomato, arugula, cheddar, and your choice of ham or bacon, all between a sliced homemade focaccia bun. And then finish your breakfast experience by ordering all the sticky buns. ALL OF THEM. Before I do. The Farmer’s Daughter in Easton is (SPOILER) run by a farmer’s daughter. Chandra Gouldrup grew up on a potato farm in Maine and learned to cook from her Sicilian grandmother before she opened this breakfast-and-lunch restaurant in Easton, with a focus on sourcing ingredients from local farms. 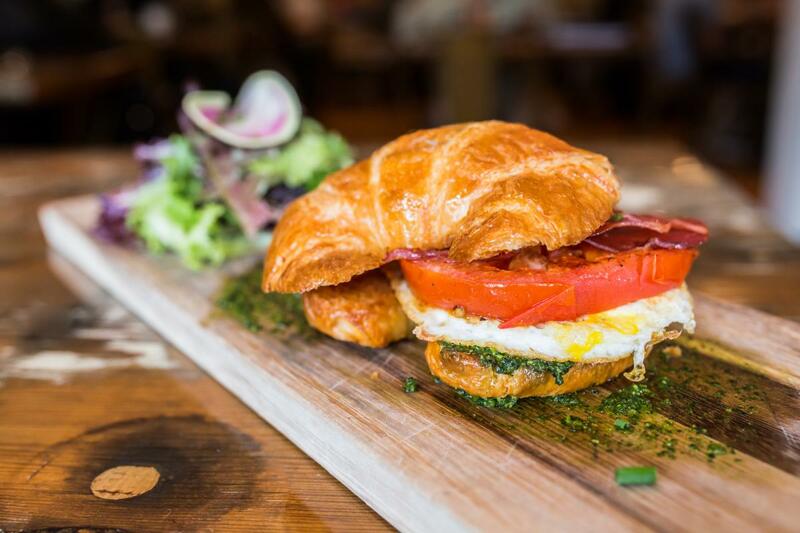 The “Green Eggs & Ham All Grown Up” is a breakfast sandwich with a youthful name but a mature palate: a fried farm egg, prosciutto cooked until the thin pieces are perfectly crispy, slow-roasted tomato with a robust summery flavor, pesto and greens on a toasted croissant. That’s right, a toasted croissant. Turns out that my favorite French pastry makes for heavenly sandwich bread! Arguments against the breakfast sandwich categorization reason that the Double Awesome isn’t technically served during traditional breakfast hours—the restaurant doesn’t open until 11 a.m.—but for those of us that like to stay up late and wake up later, 11 a.m. (or 7 p.m.) is a perfectly reasonable breakfast hour. 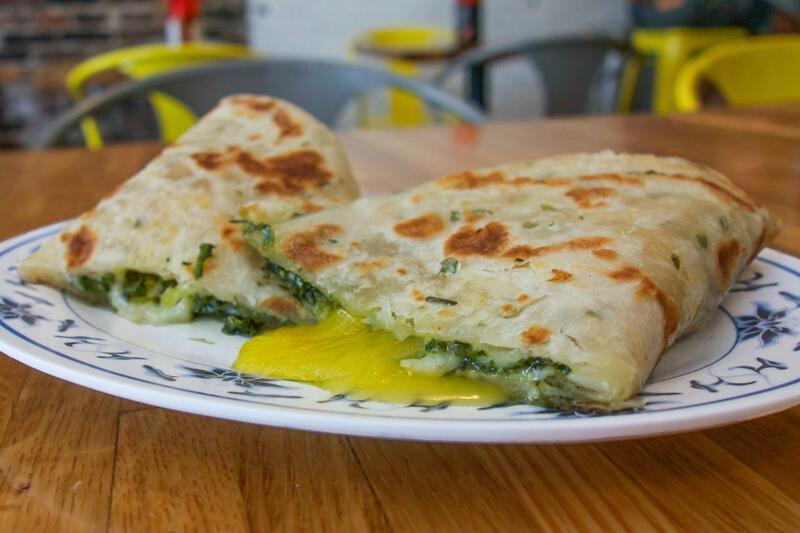 At the food truck-turned-brick-and-mortar-restaurant-turned-shipping-container, this “breakfast sandwich” starts with a scallion pancake. Next, you add TWO poached eggs with soft golden yolks, then homemade pesto and Vermont cheddar, plus a side of spicy ketchup that you should be liberal with. Understandably, I feel that the Double Awesome is a misnomer and should actually be called the Exponentially Awesome. And yes, the yolks will get messy. This is okay. If I see someone with remnants of egg yolk and spicy ketchup on their shirt, I assume that they have good taste in restaurants.